You are here: Home / Forums / Main Poker Forum / Blogs / Poker it is! Greetings to all poker enthusiasts out there! This is the humble story of a lazy student, who found his niche in poker and pursued that dream till this day. First a brief introduction. My name is Ratko, 25 and i come from the little chicken shaped country called Slovenia. Last year i hired mike-fooz as my coach, who really helped me close a gap in my game, so i was able to move to nl100. Since then i’m playing mostly nl100 rush and also taking shots at nl200-400 for the last 2-3 months, with great results. Here came the conformation for me, that poker really is the way to go. Looking back at all the discouragment from my family and friends, who never believed one could make a living out of poker, i only feel more confident on my way to become a poker pro. So this was the time i said i have to kick it up a nodge and here i am, joining the CFP program, to make some mad moneeeeeyyyzzzzz! The youtube channel is comming as soon as i have any content, which should be next week. Just want to give a shout out to Ratko who is the only player I have ever asked for their skype while at the tables (was fast fold too didn’t know he’d see it). Very solid player who i’ve had the privilege to discuss poker with on a daily basis this year. We push each other and learn from each other so i’m pretty excited we get to do cfp together as well. GL to you although I don’t think you’ll need it! Thx a lot guys! 😳 We’re about to acomplish great things here. Thx a lot guys! We’re about to acomplish great things here. Interesting story man! Will follow , good luck! Officialy started CFP now! 😎 Today and tomorrow will be mostly configuring all the sites and software so everything works and i don’t have to deal with it anymore. I will hopefully have time to squeeze in a few hours of play. SB checks, Hero bets $4.60, SB raises to $13, Hero raises to $24, ? SB checks, Hero bets $20, ? BB checks, Hero bets $13.50, BB raises to $48, Hero raises to $82.50, ? Flop: ($64) 8 6 K (2 players) Hero checks, ? Ok this is it for today. I hope you join in and post your own scenarios so we get different perspectives. First day of palying behind me. It’s really hard to concentrate on the game, now that i started played over different networks and tableselecting. Will take a week or so to get used to it. I would still say i didn’t have a specialy good day either. 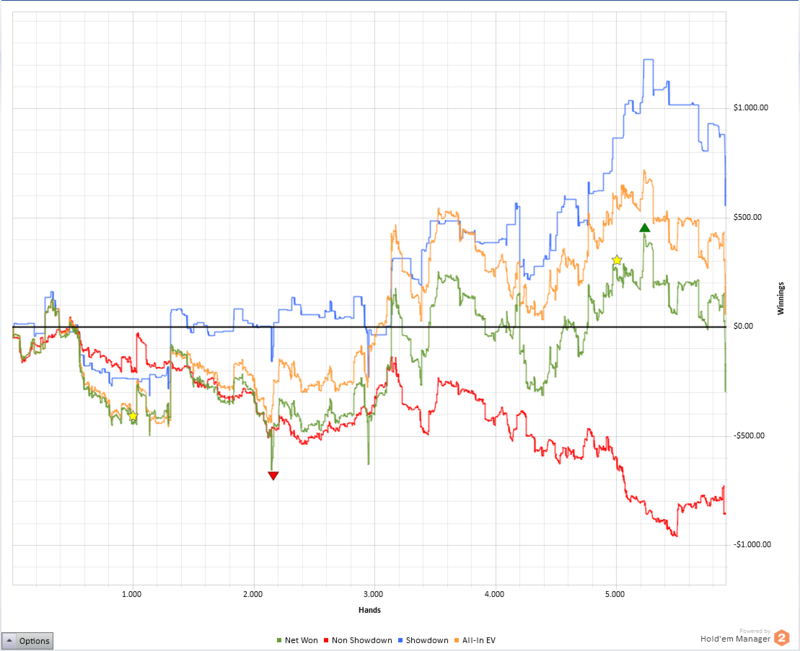 Hit -300bbs after pretty soon and had to do a stoploss. But still i think i held my ground for the first day. Now it’s just practise practise practise. =) Will be posting more on sunday, when i actually get in some volume. This play would be optimal if, villian has a hard time folding TP, and calls draws without proper odds. This play would be optimal, if villian is raising pfr with a very wide range, cbets a lot and gives up on turn. This play would be optimal , if villian fires 2 barrels and gives up on river. This play would be optimal, if villian is opens a lot sb vs bb, 4bets a 6%+ range and gives up turn if called. This play would be optimal, if villian is folding to 3bet more than 67% and 55%+ to CB. Hero bets $72.5 and is all-in, CO ? This play would be optimal, if villian is known to minraise with medium strenght hands to get to showdown cheap. This play would be optimal, if villian is only barreling river with stong value hand. This play would be optimal, if villian is known for calling 2 streets with 2nd pair. This play would be perfect if villian is 3beting with a wide range, which has many draws on this board. Also if he is barreling K high boards a lot. This play would be perfect, if villian is stabing at missed cbets 60%+ and is barreling off very agressively. This play would be perfect, if villian is checkraising a lot of air on the flop, but gives up turn mostly. This play would be perfect, if villian is floating flop a lot, stabing to turn check and giving up river. This play would be optimal, if villian is not folding to raise cb and is fighting for pots a lot. This play would be optimal, if villian is folding to 3bets 75%+ and both sb and bb have squeeze over 10%. This play would be optimal, if we only continue when we hit a set and villian pays off. This play would be optimal, if villian is not folding to 4bets, but does so vs cbets in 4bet pots. This play would be optimal, if villian is checking back 2nd pair or worse, and calls down if no overcards come. This play would be optimal, if villian bluff raises a lot with worse than AQ and gives up turn. First week is behind me. I thought it would end good, but at the last second i got a few coolers, so i finished in the red zone. This week was the warmup and i’m satisfied with it. It was a lot of hard work, but i can already see some changes in my thinking process, which is great. Plan for the next week is to play 35hours and climb slowly and steady. This weeks graph is just horrible to look at, so that’ll have to change obviously. Villian is 50 24, BTN open 56%, fold to 3bet 31%,bet missed cbet is 55% over a 2k sample. I was sure i’m ahead with my TT vs this players on this board. Should i rather bet turn small and check decide river?